While many of the 200-odd Bengali residents of Kurseong are astonished at the attack on Raj Rajeswari community hall, most fear that inter-community relations may now worsen. 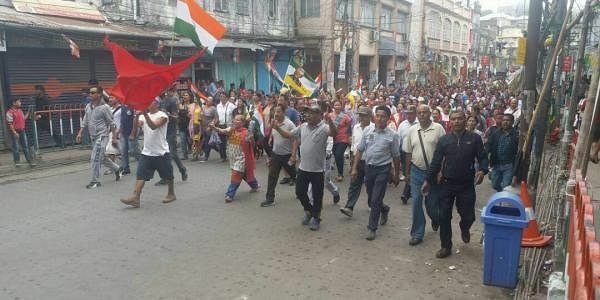 KOLKATA: The burning down of an 87-year-old community hall of the Bengali Association late on Tuesday night has exposed the brewing ethnic divide between the Gorkha and Bengali population in Kurseong town of Darjeeling district. While many of the 200-odd Bengali residents of Kurseong are astonished at the attack on Raj Rajeswari community hall — considered as the only Bengali symbol in Kurseong since 1930 — most fear that inter-community relations may now worsen. “This seems to be a handiwork of outsiders. We have no fear from the local Gorkha populace and have never faced any dangers even during the 1986-88 armed movement but we fear that outsiders may try to create problems between the local Gorkhas and Bengalis,” said Arun Ghosh, secretary of Raj Rajeswari community hall. Though more than 50 public properties were burnt since the beginning of the present phase of Gorkhaland agitation on June 8, no places of worship or community centres of minorities were harmed, which makes this attack unprecedented in the history of Gorkhaland agitation. “Only last year we celebrated 100 years of Durga Puja at Raj Rajeswari Hall. Most of the Bengalis openly support Gorkhaland statehood but this burning has made the Kurseong Bengalis really upset,” said Arunava Banerjee, whose great grandfather Bibhutibhushan Banerjee helped build the hall. The burning has also made the Bengalis more vocal against Gorkhaland. “We are forced to support the Gorkhaland statehood movement in the open but deep down we don’t want it to materialise,” said Ghosh. Relations between the two communities have also changed a lot over the period. “More than 95 per cent of the Bengalis have left town since 1980s. Only per cent of us remain,” Ghosh said indicating at the Bengali exodus from the hills since the beginning of Gorkhaland agitation in the mid-1980s. Gorkhas of the town feel that the burning was part of a conspiracy. “Burning down of Raj Rajeswari Hall was a calculated move to instigate problems between the two communities,” said Jimmy Pradhan, a local Gorkha whose house is situated right beside the burnt hall. “Raj Rajeswari Hall was part of Gorkha history too. People from outside Kurseong — either from Darjeeling or from the plains — might have done this to ignite communal passion in this town as a substantial portion of the town’s 42,500 residents are Bengalis, Marwaris and Biharis. This burning may have been done to scare them,” said cafe owner Rajesh Gurung. Apart from this, a police vehicle and a Trinamool Congress party office were also set on fire by angry protesters on Wednesday in Darjeeling town.